The definition of sadness is knowing you’ve spoiled good milk. Not by being proactive in allowing it to go past its expiration date. But by allowing bad cereal to touch its creamy goodness. Mario, how could you? How could I? Despite the explicit warning, I’m a girl who needs to taste bitter defeat on my own terms. This wasn’t about disproving that the cereal is “Luigi-grade” because that is a non-issue. Luigi will always be a winner, no matter who says what. This was about disbelieving a cereal could be so bad when it’s got marshmallow power-ups. Super Mario cereal was even worse than I could imagine. The “berry” flavour that Kellogg’s touts as part of its Mario cereal is not only non-existent, it tastes what I imagine poison tastes like. Maybe one of those poisonous berries you’re told to not pick off trees should you find yourself wandering the wilderness cold and alone. How would I know? I’ve never been in that situation. But what I do know is that the taste of the grains is inexplicably bad. Clearly, no expense was spared in creating this cereal in the tragedy department. And I haven’t even spoken about the marshmallows. They’re vaguely representative of the video game property they’re based on. Misshapen 1-up mushrooms are my favorite of the lot although they all look like they’ve seen better days. I’m not too surprised by this, and they gave me true joy as visual distractions from an otherwise sad experience. Given these horrific state of affairs, you can imagine my sorrow that my good, glass bottle milk was a victim of these hard times I introduced into my life. It is a known-fact that if it comes in a glass bottle, the milk will taste better. Or something. Trust me when I say this particular brand of milk is creamy, delicious, and very expensive. It’s a luxury milk I reserve for drinking in small, precious doses. Savouring its every tasty drop. The other day I thought milk’s favorite cookie—the plain, non-double stuffed rightful wholesome oreo—would make a good companion for my jewel of milk-kind. Alas, the milk is so good that it really should be consumed on its own. Untouched by even the greatness that is a regular, non-double stuffed oreo. As you can imagine, it was destroyed by Mario and his cereal ilk. Let us not dwell on this anymore than we have to because I will cry. Again. I’m pretty sure nothing can save this cereal. Not good milk. Not the fact that the box acts as an amiibo. Not the hilariously shaped marshmallows. 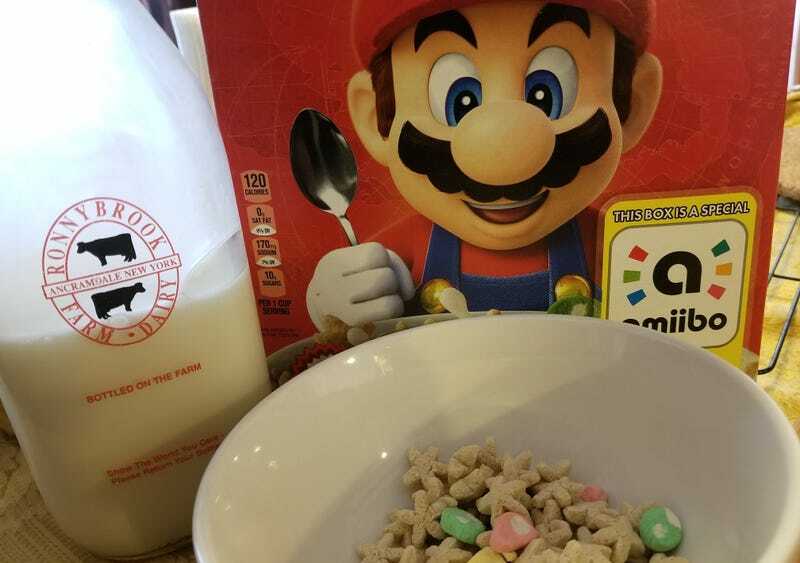 Of course, if they gave Luigi his own cereal it’d be infinitely better. I’m certain of it. I Swear I Eat Some Good Tasting Things Sometimes. Just Not These Things.